It would be nice to think that you’re completely in control of your brand’s online presence. After all, you’ve painstakingly dialed in every detail of your website, and you keep all of your social media profiles meticulously updated. But there’s one vital element you can’t leave up to chance. Reviews. What your customers say about you online can be one of the most crucial factors in drawing new customers to your brand — or keeping them away. Let’s start with the bottom line: The more reviews you have, the better your search engine rankings will be. Period. A study of more than 100,000 reviews and 22,000 local Google listings showed a direct correlation between the number of reviews your business has and its ranking on Google. The top three results in a Google search typically have at least double the number of reviews as the next three results. Every new review you receive signals the search engines that your brand is a valuable resource for your products and services which adds to your site’s authority and relevance. This in turn means you move up in the local and organic rankings. Customers are already seeking reviews to decide where to shop. If you have more reviews, those prospective customers are more likely to be able to find you in the first place. Increasingly, customers trust reviews from an online commenter as much as they would a personal recommendation from a trusted friend. In fact, 97 percent of online consumers read online reviews at least once during any given year, and 85 percent of consumers trust them implicitly. On a local level, 75 percent of customers state that reading a positive review online is enough to make them trust the business reviewed. Additionally, 84 percent of customers trust reviews when they believe they’re authentic or when they see multiple reviews for a given product, service or business. Studies also show that customers spend 41 percent more time on a website when they read positive reviews there. What your reviewers say about your company counts far more than what you say about yourself. One study showed that customers are 10 percent more likely to consider a site trustworthy if it contains reviews — even when looking at a site where everything else is the same. Reviews even matter when your customers are on the road, rather than shopping from their laptops, with 32 percent of consumers reading reviews on their mobile devices while out and about. Can you afford to lose all this positive goodwill and word-of-mouth by not having reviews published online and on your website? Customers crave data. They also crave authentic emotional connection. Reviews on your website are where the two come together. When a potential customer reads reviews on your website, they make a connection to the positive experience of previous customers. They sense that your brand is transparent and authentic, that you’re a company that cares what your customers think and feel. And as a result, they will stick around on your site, staying there longer and deepening the engagement with your brand. As a result, you not only begin to build a relationship with a new customer. You also help boost your site’s rankings (yes, those again) because of the increased time your visitors are spending on site and your lowered bounce rate. 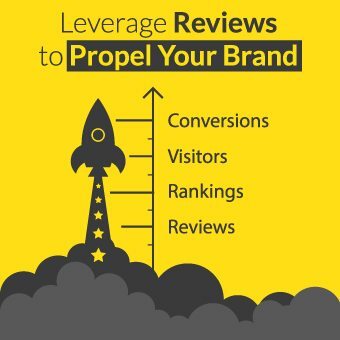 Because reviews drive your rankings, they help drive your brand’s visibility. Every single review your company receives, including from sites like Yelp and Facebook, signal the search engines that your brand is a valuable resource. That means the more reviews you get, the easier your potential customers can find you without scrolling or clicking through multiple pages of search results. And the easier they can find you, the more likely you are to see increased traffic, leads and revenue. SEO experts agree that increasing importance is being given to reviews, even when compared to social media, so getting new reviews should be part of your digital marketing strategy to attract more customers to your business. So how can you generate and leverage online reviews to improve your brand’s online presence, boost traffic and get more customers? We’re glad you asked. Boost Your Review Numbers. Review+ helps you get new reviews — yes, positive ones — and fresh reviews improve rankings. Showcase Positive Reviews. When your visitors read positive reviews on your website, they develop a relationship of trust with your brand which helps convert them to lifelong customers. Shoot for the Stars. When your Star Ratings are displayed in organic search results it will improve your click-through-rate which positively affects traffic and rankings. Control Your Online Image. Review+ lets you manage your reputation online by giving you the opportunity to resolve customer concerns before they reach the public. Stay on Top of Everything. When your customers leave reviews for your business — no matter where they leave them — you get to see them right away, so you can respond and say thank you. Learn More & Get Help! Call 480-912-3176 today and find out how Big Tuna’s Review+ solution can boost your online presence and attract more customers to your business.